In 2006 I had a part in arranging the first concert Line Kruse played in her own name in Denmark. Previous she had been performing in Aarhus with Gotan Project and she had great experience from the stages in France where she has been living for a number of years. It was a good night with French musicians and a beautiful jazz violin. Since then Stunt has released the CD Dream from 2009 and now Dancing on Air. She uses French musicians exclusively (only one exception – Lars Danielsson, bass). 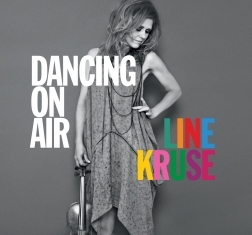 Line Kruse is both the arranger and composer. There is a modern fusion-feeling in the music, which isn’t weird since this genre has had a better life in France than in Denmark. She doesn’t hold back the effects on the first half of the album where a number like Smoke has a delicious-funky-club-feeling. It comes right after Wandering Winds which is highland-filmscore-music from Scotland – a very inappropriate and weak number on a fine album. Line Kruse has a gentle side too. The beautiful and clarified version of Eric Satie’s Gymnopedie no. 1 must be mentioned. Modern jazz violin is still relevant. Thanks to Line Kruse.